The Norman lust for battle and ravenous desire for land and treasure can, like their famous sword be undoubtedly traced to their Viking forefathers who wrenched their homeland in northwestern France from the hands of Charles the Simple in the Treaty of Saint-Clair-sur- Epte in 911 AD. Never satisfied with thier lot, it wasn't long before they once again took up their broad, double- edged swords and set sail across the English Channel to conquer Britain most famously, at the battle of Hastings in 1066 AD. 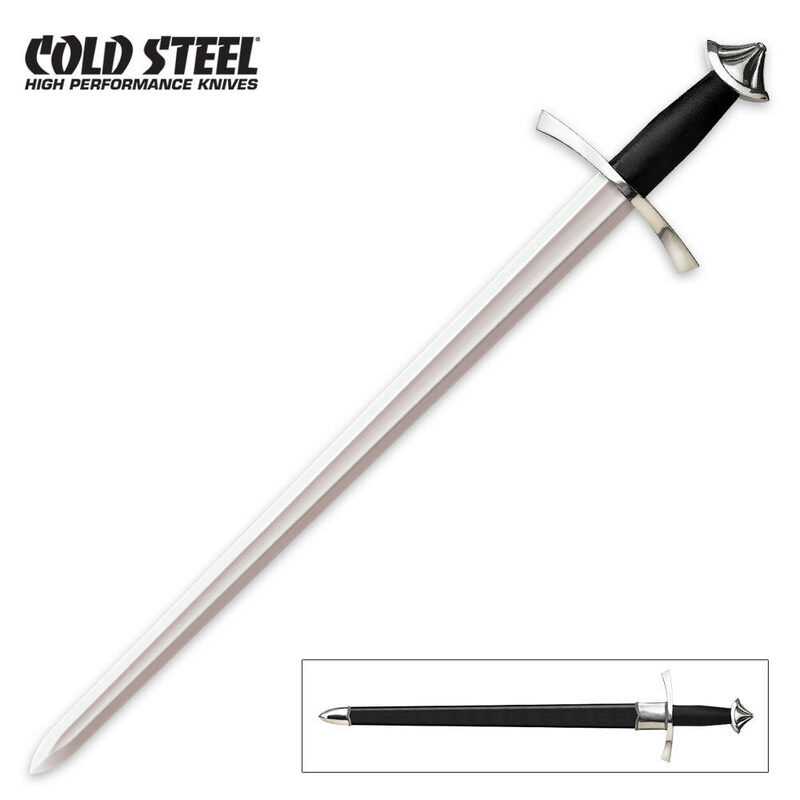 Now Cold Steel is pleased to offer you our battle ready version of this famous sword. Like the originals we have studied, it offers a long wide blade with fully sharpened edges and a very useful point. To insure it's light enough to be easily wielded with one hand we have also added a single broad fuller in the center of the blade that serves to reduce weight, improve balance and add the stiffness needed to withstand heavy blows. The hilt of our Norman Sword is also reminiscent of many surviving originals with upturned, spatulated quillons, leather-over-wood grip, and a modified "cocked hat" pommel. This pommel shape was specially chosen because it allows more room for the hand, while counter balancing the blade and serving as a weapon in its own right. Overall Length: 37 1/4 in. Scabbard: Leather/Wood Scabbard w/ Steel Fittings.